Join Brian Holmes, Howard Silverman, and Mack McFarland for a bioregional beer at The Oregon Public House, 700 NE Dekum St, on Saturday April 6th, at 3:30pm. 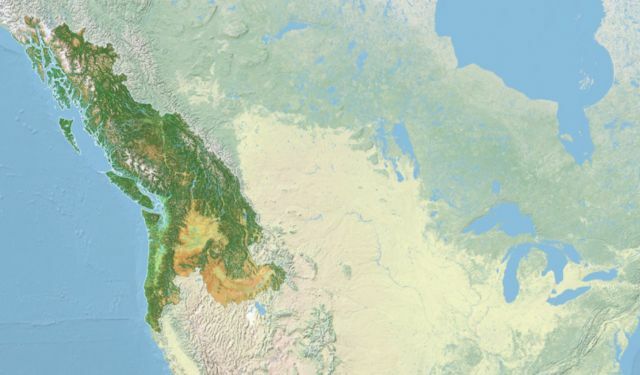 They’ll discuss the online atlas Learning from Cascadia, as well as the futures of bioregionalism in the Anthropocene and a new interactive mapping tool that we will be launching. All are welcome, the first 15 folks to show up will get a free beer. Learning from Cascadia was commissioned by PNCA and is made possible thanks to the generosity of ﻿c3:initiative, where Brian Holmes has been in residency on three occasions, and thanks to the support of the Oregon Cultural Trust. Brian Holmes is a polyglot art and cultural critic who got waylaid by the Anthropocene. After doing his PhD in Romance Languages in the 1980s at UC Berkeley, Holmes moved to Paris and became involved with art and activism, working as English editor for the publications of Documenta X and agitating in the counter-globalization movement. His essays on art, political economy and social change have appeared in journals and magazines such as Springerin, Multitudes, Brumaria, Open, #Errata and E-flux, as well as innumerable exhibition catalogues and three books of collected essays (Hieroglyphs of the Future, Unleashing the Collective Phantoms and Escape the Overcode). He has lectured at museums and universities around the world and taught occasional classes in cultural theory at the European Graduate School in Saas-Fe, Switzerland, and later at the University of Illinois at Chicago. Mack McFarland is a cultural producer and has worked as Curator for Pacific Northwest College of Art since 2006. Currently McFarland is the Director of the Center for Contemporary Art & Culture at PNCA. His exhibitions at PNCA have included commissioned projects of new works from tactical media practitioners Critical Art Ensemble, Eva and Franco Mattes, and Disorientalism. He has also curated a review of Luc Tuymans’s printed works, a group exhibit marking the centennial of John Cage’s birth, and a comprehensive look at the process of the comic journalist Joe Sacco. McFarland’s current question is how exhibitions and artworks can meaningfully link to our shared experience of existing together and within the ongoing process of history. The Pacific Northwest College of Art works to reimagine what art and design can do in the world is the only art and design college located in one of the most progressive cities in the United States. For all of its one hundred-plus years, PNCA has nurtured the talent in its students for radically reimagining everything, transforming the lives of our students and everyone they touch. Our studios and galleries continue to give rise to a vibrant community of innovators and culture-makers who shape the cultural landscape.